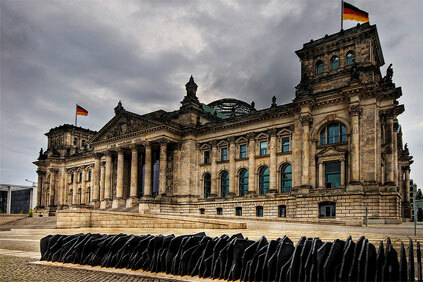 GERMANY: Germany’s new renewable energy law has passed through parliament in the second and third readings, in parallel with a law allowing each federal state to independently set the distance of wind turbines to the nearest houses. The law has gone through despite additional last-minute demands from the European Commission made on 23 June. Bavaria is setting a minimum distance of ten times the turbine height, which threatens to virtually rule out wind development in the state. Both laws are to take effect on 1 August. Federal states setting minimum distances must do so before the end of 2015. The new Renewable Energy Act caps onshore wind expansion at 2.5GW per year not including net additions from repowering projects. Offshore wind is limited to 6.5GW by end-2020, albeit with some flexibility allowed for installations to reach up to 7.2GW. The law is a three-year interim measure, to be followed by new legislation setting out the rules for renewables tendering procedures beginning in 2017 and on market integration of renewables, according to federal economy minister Sigmar Gabriel. You may review our statement again here. What we didn’t say was that there were aspects of the report that were unprofessional. Just as the report on health effects by Colby et al in 2010 bizarrely claimed that not only was there no evidence of health problems from turbine noise there was so little evidence that no further research was warranted, the MPAC study spent considerable time trying to lay waste to the work done by Ontario real estate appraiser Ben Lansink. Mr Lansink, an AACI (accredited appraiser Canadian Institute), has appeared before numerous tribunals and in court as an expert witness on “injurious affection”; he studied several areas of Ontario where wind power projects operate, and documented the effect on property value. Reviewers Michael McCann and Wayne Gulden have now done formal critiques of the MPAC study, and while criticizing its methodology and results, also claim that the action of an Ontario Crown corporation to discredit a professional real estate appraiser were uncalled for. The interesting thing is that the chief appraiser at MPAC is himself an AACI, i.e., not just an assessor, so there is a case to be made about the work done under his supervision, with regard to a fellow member of the Appraisal Institute of Canada. They have rules about such things. Those interested should contact the Institute’s Professional Practice section. A U.S. wind power developer that is seeking $653-million in damages under a NAFTA challenge accuses the government of Ontario of manipulating Green Energy Act rules to benefit the interests of Liberal-connected firms, according to court documents obtained by the National Post. At issue in the NAFTA arbitration are changes made to the Green Energy Act in 2011. They allowed wind developers a brief window in which they could change the location at which their proposed projects would connect to the transmission grid. NextEra, a multinational renewables firm that was represented to the government by lobbyist Bob Lopinksi, a former senior staffer in the office of Dalton McGuinty, changed their connection points and was eventually awarded more than $2-billion worth of power contracts. Mesa Power says in its court filing that the change effectively bumped its projects out of line, costing it sunk costs and lost future profits. “The rules were changed to suit one applicant to the detriment of another,” the court document claims. “NextEra also gained assistance through the Ontario Premier’s office,” the filing alleges. “The Premier’s office injected itself into the [Feed-in-Tariff] program, and began expressing its political preferences for matters that where entirely within the regulatory realm of the [Ontario Power Authority]. A local energy co-op that has caused some controversy in the county continues to move forward. The Oxford Community Energy Co-operative (OCEC) announced the Financial Services Commission of Ontario approved its formation. “The board of directors of the Oxford Community Energy Co-op is very excited that we have received the receipted Offering Statement from FSCO. We can now start our capital raising campaign. We would like to talk to anyone in this community who wants to become a part owner of the Gunn’s Hill Wind Farm because I am confident that we can offer a very attractive return on the investment,” Helmut Schneider, president of OCEC, said in a press release. The first project on the co-op’s radar is the Gunn’s Hill wind turbines in Norwich Township being developed by Prowind Canada Inc.
Juan Anderson, vice-president of Prowind, said he expects the project to receive its Renewable Energy Approval by August after the Ministry of Environment completes its technical review of the application. “We anticipate that under any new government there will be increased involvement of municipalities in the development process of renewable energy projects. We also see potential for further emphasis on co-operative and First Nations ownership in projects and we feel that the work we are doing with Oxford Community Energy Co-operative and Six Nations can be an example of how to share the benefits of a project more widely,” Anderson said when asked how a change in provincial leadership might effect the project. The OCEC is looking to raise up to 49% of the project equity, which is approximately $9 million. As per the OCEC website (http:// oxfordcommunityenergycoop. wildapricot. org), the hope is to raise $1.2 million of the equity from Oxford County investors and the remainder from across Ontario. Currently the co-op has more than 50 members. “The anticipated investment returns for preferred shares will be paid annually in the form of dividends, which are projected to be in the range 10 %,” the website stated. The project is facing several hurdles in its last leg before possibly receiving approval to start building. The East Oxford Community Alliance has notified Prowind of potential litigation if the project moves forward. Norwich Township deemed itself an unwilling host for the project several years ago and maintains that status. Read the full story and take the poll here. Editor’s note: Mr Anderson is possibly premature in his announcement; the documents filed by Prowind with the Ministry of the Environment which were deemed “complete” ae now the subject of a complaint to the Office of the Ombudsman of Ontario due to serious omissions and inadequacies in the documentation. Mr Anderson must also be unaware that there is an election in Ontario June 12th, and the further approval of wind power projects has been an important issue in the campaign. Industry and the Ministry of the Environment not telling appellants or Tribunal what they’re up to. (KAWARTHA LAKES) Ward 16 Councillor Heather Stauble says it is disturbing that the Environmental Review Tribunal (ERT) hearing the appeal of a wind energy project in Manvers Township is not getting information from the developer and the Province. Last December, the Province granted wpd Canada approval for its Sumac Ridge wind energy project, which would see the installation of five large turbines near Bethany. Manvers Wind Concerns, Cransley Home Farm Limited and the Cham Shan Temple are appealing. The Cham Shan Temple is an initiative of the Buddhist Association of Canada that will mirror the four great Temples in China. One is almost completed and three more are planned for the City of Kawartha Lakes, a total investment of about $100 million. Coun. Stauble said there has been ongoing correspondence between wpd Canada and the Ministry of Environment, but the appellants and the ERT panel have not been privy to that information. The Fort William First Nation sought and won an adjournment in its fight against Horizon Wind’s planned wind power project in the Nor’Westers, until after the election. See the video interview of Chief Morrisseau here. The documentary film Down Wind airs tonight at 8 PM EDT on the Sun News network. Here is a column from journalist Jerry Agar on the film. It is heart wrenching to see and feel the pain of fellow Ontarians breaking down in tears as they explain how the Liberal government drove them from their homes. But to understand how cold and callous our current political leadership is in this province, you need to experience it. 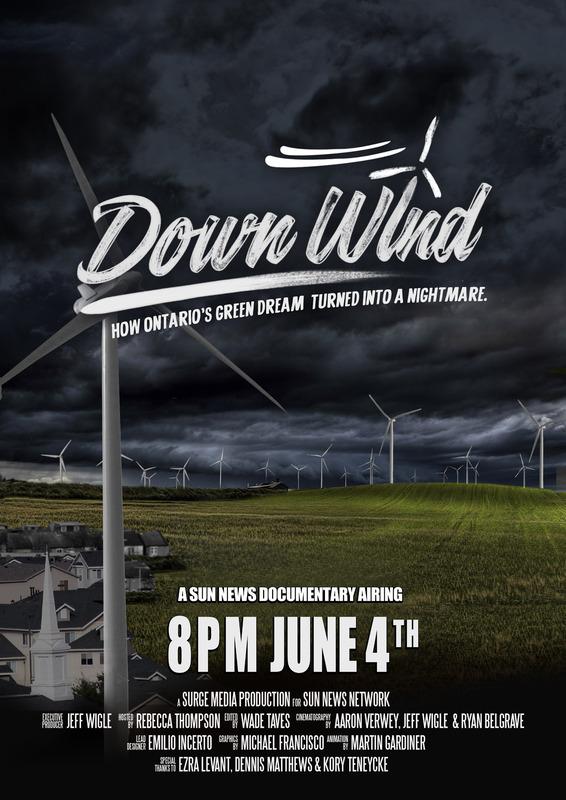 Rebecca Thompson’s documentary, Down Wind: How Ontario’s Green Dream Turned into a Nightmare (Surge Media Productions), airs on Sun News Wednesday at 8 p.m. and 11 p.m. It is a story of reckless, agenda-driven politics resulting in shattered lives. The Ontario Liberal government’s Green Energy Act isn’t just an economic failure; it is an act of brutal indifference to the human cost of politics. A cost ignored by people living far from the thump of the giant wind turbines, secure in their downtown Toronto homes and politically correct theories; a safe distance from places like Ripley, Clear Creek and Lucknow, Ontario. Many may not care – worshiping as they do at the altar of so-called green energy – that the jobs promised by the Liberals through their Green Energy Act were never delivered, while the cost of hydro skyrocketed. But the human cost should matter to us all. Giant wind turbines, as high as 50 storeys, with blades the size of a 747, were foisted on communities in rural Ontario with no consultation or agreement from the residents, their municipal governments having been stripped of their planning powers by the Green Energy Act. Unlike politicians who pay lip service to “serving others” while stomping all over people’s lives and looking after themselves, Norma Schmidt spent her life in Underwood, Ontario in the actual service of others as a nurse and instructor of future nurses. She and her husband spent their lives in the home they lovingly restored over the years; a place they had hoped to share with their grandchildren. But Norma has been forced out of her home by severe migraines and depression, brought on by the relentless noise and vibration from the industrial wind turbines erected practically in her back yard. She left both the job and the home she loved, escaping to a room in her daughter’s house. It is not the life she worked all these years to achieve, and it is not what she deserves. Do Norma’s tears, and those of others similarly affected, fall to no effect at the feet of Premier Kathleen Wynne? Norma’s story is one among many, some of them told in Down Wind. This is the same Dalton McGuinty/Wynne Liberal government that used public money to reward violent aboriginal protesters who seized private property and terrorized people in Caledonia. That “occupation” continues today and the government, knowing that their voting base in Toronto couldn’t care less about some rubes in the country, keeps the issue quiet by caving into thugs, rather than protecting law-abiding citizens. Would the government be as forgiving to people across rural Ontario if some were to blow up a few of the industrial wind turbines that have made their lives hell? Of course not. There are no turbines thumping the night away in Don Valley West or Toronto-Centre. It remains to be seen whether the people in such ridings, who overwhelmingly voted Liberal in 2011, will care more for their fellow citizens in rural Ontario this time around. There are any number of political parties to support other than the Liberals. Here from law firm Gowling Lafleur Henderson an opinion on whether FIT contracts can be cancelled, following a change of government. The answer? It depends. If a contract is at the stage where the Notice To Proceed or NTP has not been issued, then a contract may well not be fulfilled. Read the full article here, and an excerpt follows. “A perhaps somewhat overlooked section of the form of FIT Contract deals with the consequences of “discriminatory actions” by the Legislative Assembly of Ontario. Non-discriminatory action clauses, developed and refined over the past three decades by project sponsors working on projects reliant upon concessions from government counterparties somewhat less reputable than Ontario, seek to provide project sponsors with some form of protection should the government take action to unilaterally amend the terms of the concession contract or affect an increase to the taxes, regulatory burden or other costs associated with the project in a way that could not have been reasonably expected under the terms of the original concession. Ontario’s FIT contracts all contain a short-form version of a non-discriminatory action clause which, though protective of the supplier, is subject to key exceptions, including the passage of laws that are of “general application” and new regulations created under theGreen Energy and Green Economy Act, 2009. It is also worth noting that, unlike project finance concession agreements designed for use in emerging markets, which might provide for dispute resolution outside of the jurisdiction, the FIT contract is subject to dispute resolution provisions contemplating arbitration in Toronto. The non-discriminatory action clause contained in Ontario’s FIT contracts is less than perfect from a sponsor’s viewpoint; however, it does provide some basic protection. The possibility exists of new laws or regulations coming into force after the election that would have an adverse effect on suppliers who are in a post-NTP or post-commercial operation position under an existing FIT Contract. Given Ontario’s long history of carefully honouring electricity sector concession holder’s contractual rights, it seems unlikely that a new government would seek to use regulatory or legislative change to indirectly penalize electricity sector investors – particularly given the clear pre-NTP cancellation rights already existing in the FIT contracts. If unilateral legislative or regulatory change is promulgated, the challenge for suppliers will be to demonstrate that a specific law is not of general application or to challenge the scope of a regulation under the Green Energy and Green Economy Act, 2009. A government seeking to table unilateral changes of a material nature to the FIT program would presumably be made cognizant of the potential impact that such changes would have on the province’s reputation, as a contracting party and its credit rating by the Ministry of Finance. In the summer of 2003, just before Dalton McGuinty’s Liberals gained power in Ontario, 50 million people in the U.S. Eastern Seaboard and Ontario suffered an electricity blackout caused “when a tree branch in Ohio started an outage that cascaded across a broad swath from Michigan to New England and Canada.” Back in 2003 Ontario’s electricity prices were 4.3 cents a kilowatt hour (kWh) and delivery costs added 1.5 cents per kWh. An additional charge of 0.7 cents — known as the debt retirement charge to pay back Ontario Hydro’s legacy debt of $7.8-billion — brought all-in costs to the average consumer to 6.5 cents per kWh. Fast forward 11 years. Today, Ontario electricity costs average over 9 cents per kWh, delivery costs 3 cents per kWh or more, the 0.7-cent debt retirement charge is still being charged, plus a new 8% provincial sales tax. Additional regulatory charges take all-in costs to well over 15 cents per kWh.. The increase in the past 10 years averaged over 11% annually. Recently, the Energy Minister forecast the final consumer electricity bill will jump another 33% over the next three years and 42% in the next 5 years. Summing up: Whatever mess existed in 2003 is billions of dollars worse today. The cost of electricity for the average Ontario consumer went from $780 on the day Dalton McGuinty’s Liberals took power to more than $1,800, with more increases to come. The additional $1,020 in after-tax dollars extracted from the province’s 4.5 million ratepayers is $4.6 billion – per year! First, the Liberal Party fell under the influence of the Green Energy Act Alliance (GEAA), a green activist group that evolved into a corporate industry lobby group that adopted anthropogenic global warming as a business strategy. The strategy: Get government subsidies for renewable energy. The GEAA convinced the McGuinty Liberals to follow the European model. That model was: Replace fossil-fuel-generated electricity with renewable energy from wind, solar and biomass (wood chips to zoo poo). In the minds of those who framed the Liberal’s energy policies, electricity generated from wind, solar, biomass – green energy – was the way of the future. Ontario Power Trip: Good advice from the Ontario Energy Association? The plan was implemented through the 2009 Green Energy and Green Economy Act (GEA), a sweeping, even draconian, legislative intervention that included conservation spending and massive subsidies for wind, solar and biomass via a euro-style feed-in-tariff scheme. The GEA created a rush to Ontario by international companies seeking above market prices, a rush that pushed the price of electricity higher. The greater the increase in green energy investment, the higher prices would go. At the same time, Liberals forced installation of smart meters, a measure that added $2-billion to distribution costs. Billions more were needed for transmission lines to hook up the new wind and solar generators. At the same time, wind and solar generation – being unstable – needed back-up generation, which forced the construction of new gas plants. The gas plants themselves became the target of further government intervention, leading to the $1-billion gas plant scandal. To force adoption of often unpopular wind and solar plants, the GEA took away municipal rights relating to all generation projects, stripping rural communities of their authority to accept or reject them. To pay for the rising subsidies to wind and solar, the Liberals adopted an accounting device that would spread the cost over all electricity consumers. The device was called the “Global Adjustment.” The Global Adjustment draw on consumers grew fast and will continue its upward movement. In effect, the Global Adjustment is a dump on ratepayers for energy costs that are above market rates. During 2013, the total global adjustment was $7.8-billion. Of that, 52% went to gas/wind/solar/biomass. The GA for 2014 is expected to rise to $8.6-billion, adding another 2.9 cents per kWh for each electricity consumer. To oversee all this, the Liberals established the Ontario Power Authority to do long-term energy planning (LTEP) and to contract renewable generation under the feed-in tariff (FIT) program that guaranteed wind and solar generators above-market prices for 20 years or more. In 10 years Ontarians have seen four versions of the so-called long-term plan, suggesting there is nothing long-term or planned. The Auditor General’s report of Dec 5, 2011, disclosed that no cost/benefit analysis was completed in respect to those feed-in tariff contracts. The almost 100 directives over the past 11 years from Liberal energy ministers have instructed the OPA, the Ontario Energy Board, Ontario Power Generation and Hydro One on a wide variety of issues from building a tunnel under Niagara Falls to paying producers for not generating power, subsidizing industrial clients for conservation while subsidizing other industrial clients for consumption. Numerous new programs have been created that support clients in Northern Ontario, urban clients for purchasing EVs (electric vehicles), homeowners for purchasing CFL light bulbs and a host of other concepts without weighing the effect on employers or taxpayers. Aside from the burden on consumers, Ontario’s Power Trip has cost jobs as companies – Caterpillar, Heinz, Unilever and others – closed Ontario operations while others, such as Magna, failed to invest in Ontario due to high electricity prices and high taxes that would have created private sector jobs. Were “green energy” jobs created? Government claims hit 31,000 in a press release in June 2013 but since then no mention of green job claims appears in releases. The recent budget of Finance Minister Charles Sousa reported 10,100 jobs in the “clean tech” sector, a far cry from earlier claims. Ontario Hydro may well have been a mess a decade ago. But it was a mess that produced electricity priced to consumers at 6.5 cents a kWh. Current prices of 15 cents a kWh will rise to over 20 cents a kWh by 2018/19, forcing the average Ontario ratepayer to pay an additional $700 annually. By that date the cost of “renewable energy” to Ontario’s 4.5 million ratepayers will result in an annual extraction of $8-billion to satisfy the perceived benefits of wind, solar and biomass. Over the 20 years of the FIT contracts, $160-billion in disposable income will be removed from ratepayer’s pockets to access a basic commodity, all in the name of “global warming” and renewable power without use of a cost/benefit analysis. Perhaps it is time for a change in the governing of Ontario and particularly the way the electricity sector is overseen. Parker Gallant is a former Canadian banker who looked at his local electricity bill and didn’t like what he saw.